I belong to Knitting Paradise forum and joined a KAL ( Knit Along) to 14 hats in 2014. 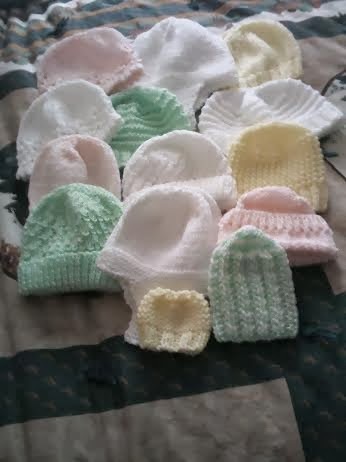 I chose to make hats for babies from tiny preemie to newborn. I have used up some more stash making them and enjoyed the challenge plus I have used new patterns and learnt to shape crowns in different ways. The green and white one in the front looks odd but it is knitted in a rib pattern and stretches to fit the babies head, the tiny one in yellow next to it is for a tiny preemie baby all were easy to make as I used these knitting patterns. lovely hats Paula, you have made so many!